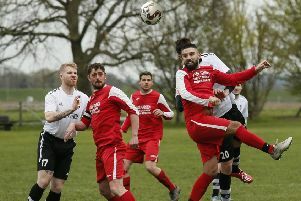 Thomas Vandenbergh hammered four goals as The 61 FC (Luton) enjoyed a thumping 8-1 win at Hale Leys United in their SSML Division Two clash on Saturday. Shaka Anderson bagged a brace, while Ryan Smith and Nathan Henry were on target. Totternhoe were beaten 3-2 by Thame Rangers as Jonny Clarke (13) and Daniel Lambeth (53) netted. This weekend, Totternhoe host Aston Clinton, with The 61 FC (Luton) away to Tring Corinthians in the Division Two Cup. Temitayo Akerele scored twice for The 61 FC (Luton) Reserves as they lost 4-2 at home to Westoning in the Beds County League Division One clash on Saturday. Totternhoe Reserves were beaten 1-0 at Shefford Town & Campton Reserves. This weekend, Totternhoe Res travel to The 61 FC (Luton) Res and Crawley Green Res host Meltis Albion. Slip End United beat Club Swan 2-1 in their Leighton League Division Two contest. United fell behind, only for James Caulfield to equalise, while he then won a penalty which was converted by Ryan Cowley.